Major General Marcelite J. Harris of the U.S. Air Force was born on January 16, 1943 in Houston, Texas to Cecil O’Neal Jordan and Marcelite Terrill Jordan, Harris grew up in Houston and graduated from Kashmere High School in 1960 before enrolling at Spelman College where she earned a bachelors in speech in drama in 1964. She also holds a 1989 bachelors of science degree from the University of Maryland. After graduation from Spelman, Harris joined the U.S. Air Force and was sent to Lackland Air Force Base in San Antonio, Texas where, because of her college background, she entered Officer Training School. After completing the program in December, 1965, she was commissioned a Second Lieutenant in the U.S. Air Force. Her first assignment was as Assistant Director for Administration, 60th Military airlift Wing, Travis Air Force Base, California. Harris completed a tour of duty in West Germany in 1971 and then enrolled in the Aircraft Maintenance Officer Course at Chanute Air Force Base, Illinois. After exceptional work and performance, she was named Aircraft Maintenance Officer, the first woman to hold this rank. In 1971, she was then assigned to be Maintenance Supervisor for the 49th Tactical Fighter Squadron at the Korat Royal Thai Air Force Base in Thailand. After that assignment ended in 1973 she was assigned as Job Control Officer with 916th Air Refueling Squadron, at Travis Air Force Base. In 1975 Harris was assigned as a Personnel Staff Officer for the Air Force at the Pentagon. In 1975 her eleven-year career in the U.S. Air Force took a dramatic turn when she was named a White House aide during the Presidential administrations of Gerald Ford and Jimmy Carter. Harris continue to rise in rank and on May 25, 1995, Harris was promoted to two-star Major General. She was the first woman to hold the position of Major General in the U.S. Air Force. Harris’s next promotion was as Commanding Officer of Air Force Cadet Squadron 39 at the Air Force Academy in Colorado Springs, Colorado in 1978. At the time she was one of only two women in the history of the Air Force to have that assignment. In November 1982 she was assigned to the Pacific Air Force Logistic Support Center at Kadena Air Base in Japan and four years later she became Deputy commander for maintenance at Kessler Air Base in Mississippiand the first woman Wing Commander in 1988. 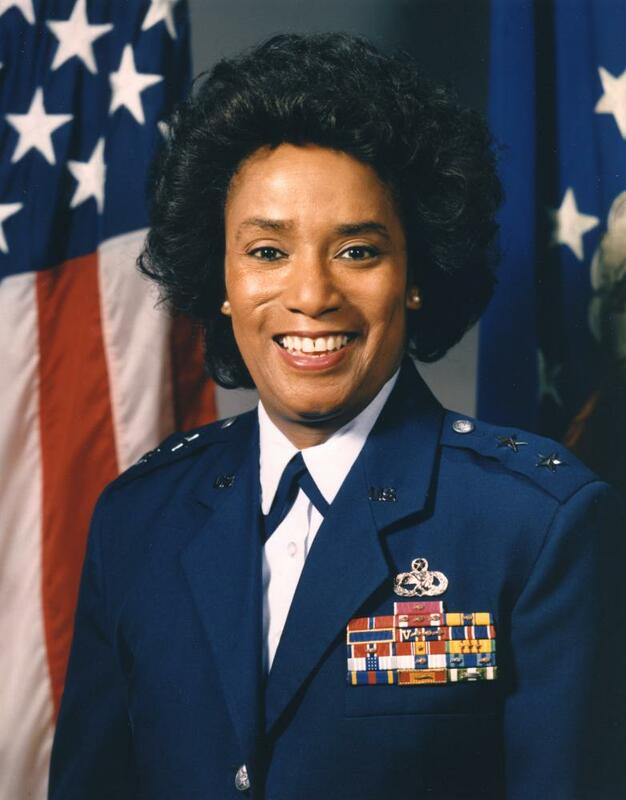 On May 1, 1991 Harris was promoted to Brigadier General making her the first African American woman general in the U.S. Air Force. Major General Harris’s last major assignment with the Air Force came in 1994 when she served as the Director of Technical Training at Headquarters Air Education and Training Command, Randolph Air Force Base, Texas. There she was responsible for a world-wide workforce of 125,000 technicians and managers and oversaw a budget of $250 billion. Harris was promoted to Major General on May 25, 1995 and retired at that rank on February 23, 1997. General Harris continues to serve in a number of post-retirement roles. She has been Treasurer of the Atlanta, Georgia Branch of the NAACP and a Director on the board of Peachtree Hope Charter School. In September 2010, President Barack Obama appointed Harris to serve as a member of the Board of Visitors for the United States Air Force Academy. “Biography of Marcelite J. Harris.” Maj. Gen. Marcelite Harris | The HistoryMakers, March 21, 2012, http://www.thehistorymakers.org/biography/maj-gen-marcelite-harris. “Marcelite J. Harris.” U.S. Air Force Biographies, U.S. Air Force, http://www.af.mil/About-Us/Biographies/Display/Article/106829/major-general-marcelite-j-harris/.